Have you ever been to a Bonefish Grill and had their Bang Bang Shrimp? 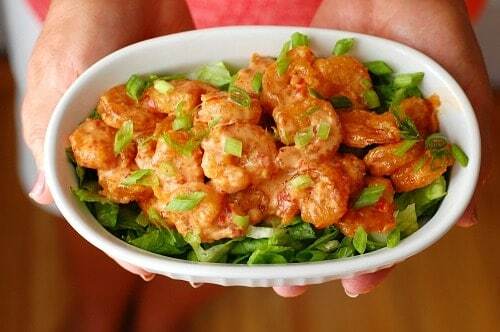 Bang bang shrimp is one of my favorite appetizers of all time. This copycat recipe comes really close to the original. Wednesday is Bonefish Grill bang bang shrimp day, $6.00 for an order. (Used to be $5.00!) Mary Jo and I like to get an order for each of us and get a side salad and call it supper. Add to that a happy hour priced chardonnay, (4 pm until 6:30 pm in Florida). Yummy eats. I’ve been wanting to try to re-create this and finally got around to it. 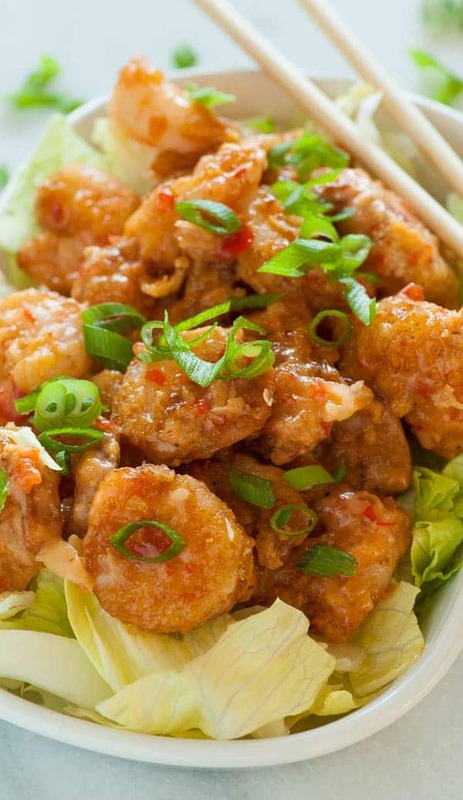 This recipe is pretty darned close to the original bang bang shrimp recipe from Bonefish Grill. What Does Bang Bang Sauce Taste Like? One of the keys to this is getting the sauce right. It’s spicy but not terribly hot. It’s creamy, but not a heavy cream. It tastes Asian inspired and is a good blend of spicy and sweet. The best thing about it is that it compliments the slight crunchiness of the pint sized shrimp so well. I made mine with mayonnaise, Mae Ploy sweet chili sauce, and Huy Fong chili garlic sauce. 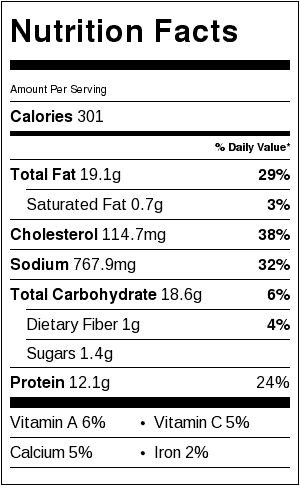 These particular ingredients were mentioned in a comment section of another blog by a guy who said he worked at Bonefish Grill. Hey, if he makes it, he should know. It ends up tasting like Bonefish Grill. The proportions could be a little different. 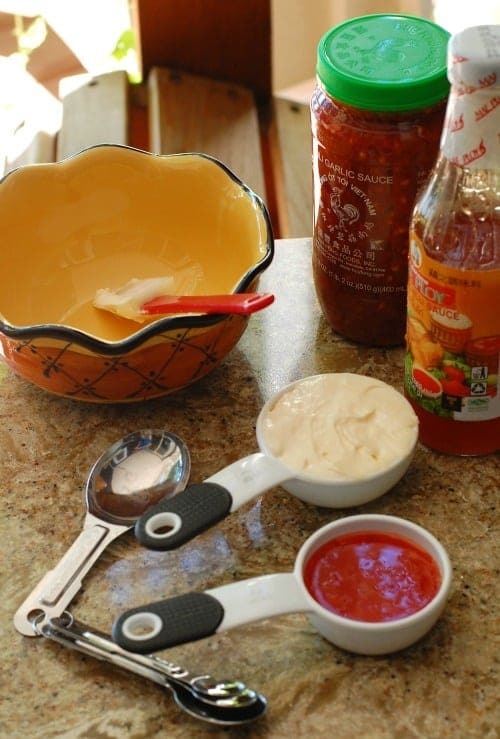 The chili garlic sauce is made by the Huy Fong company who makes the famous Rooster brand sriracha sauce and it is plenty spicy. I added 2 tablespoons to the sauce but you can add less if you don’t like it so spicy. I just ended up adding a teaspoon at a time then tasted it. I got all the way to 6 teaspoons but by that time, my taste buds were pretty much accustomed to the heat. Mary Jo thought the heat was about right! Another thing is the frying method. Bonefish has nice deep fryers to use. For the home cook, it can be a little harder. I first tried to fry the bang bang shrimp in a skillet with about 3/4 inch of oil. After dropping the coated shrimp into the oil and the cornstarch would touch the bottom of the skillet and a lot of the breading stuck to the bottom. It just didn’t work very well. Thinking about a deep fryer, I thought that a basket might be the solution. I couldn’t find a separate basket, but picked up a kitchen spider. This made dropping the shrimp into the oil really easy. Lower the basket into the oil and fry for about 2 minutes or so, it’s easy to check how brown the shrimp are getting when using the kitchen spider. Then dump the fried shrimp onto a cooling rack set over a layer of paper towels. The cooling rack keeps the shrimp from getting soggy like they would if placed directly on paper towels. I bought the shrimp at Walmart. It was 60-80 size, frozen, shelled and deveined…and it was $5.00 for 12 ounces. I thawed them, then soaked the shrimp in buttermilk for 30 minutes. Marinating in buttermilk is a step that can be used for other fish, for chicken, for mutton, or even liver to eliminate any fishy or gamey flavors. Bonefish Grill bang bang shrimp has a distinct crunch, and this was a little harder to recreate. I tried breading with all-purpose flour, straight cornstarch, flour/cornstarch combined, then cornstarch with a little panko breadcrumbs. Straight cornstarch is pretty good, but adding some panko breadcrumbs gave the shrimp a nice crunch that was closer to the Bonefish Grill shrimp. *After making the recipe again, I added 1 teaspoon of baking soda to the cornstarch dredge and the shrimp browned much better. It makes a really nicely browned shrimp. 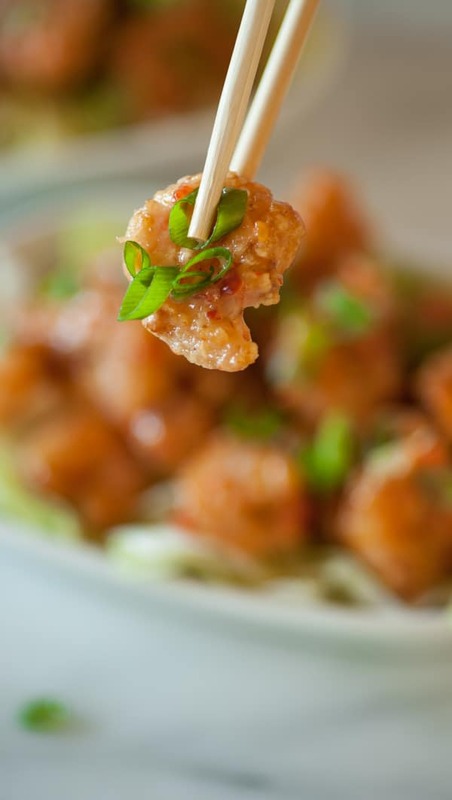 What do you Serve with Bang Bang Shrimp? 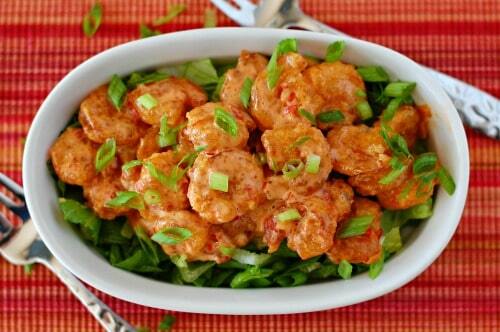 Bang bang shrimp is an appetizer but it sure could be the main course of a light meal. Fix a leafy greens salad of romaine, arugula, and spinach. Then add an olive oil, vinegar vinaigrette. Creamy dressings such as blue cheese, ranch, or French would be too heavy tasting. Throw on some tomatoes and cucumber if you’d like also. A dry white wine or a not too sweet rosé wine would be perfect too. For a non-alcoholic drink, have some water with a wedge of lemon. This is the type of appetizer to make if you are having an informal gathering with friends. Once all the ingredients are laid out, the frying goes quickly and you want to eat these soon after they’re done. Serve on a bed of chopped lettuce and garnish with some green onion. This is delicious! This recipe comes pretty close to the taste and texture of the original Bonefish Grill bang bang shrimp. 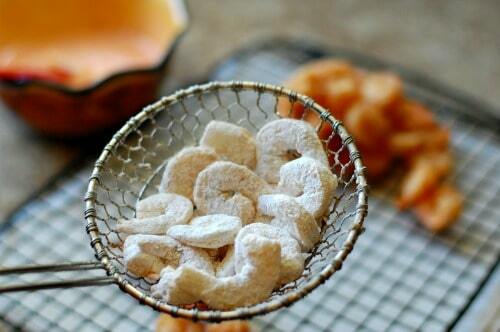 Mix cornstarch, panko crumbs and baking soda in a shallow bowl. 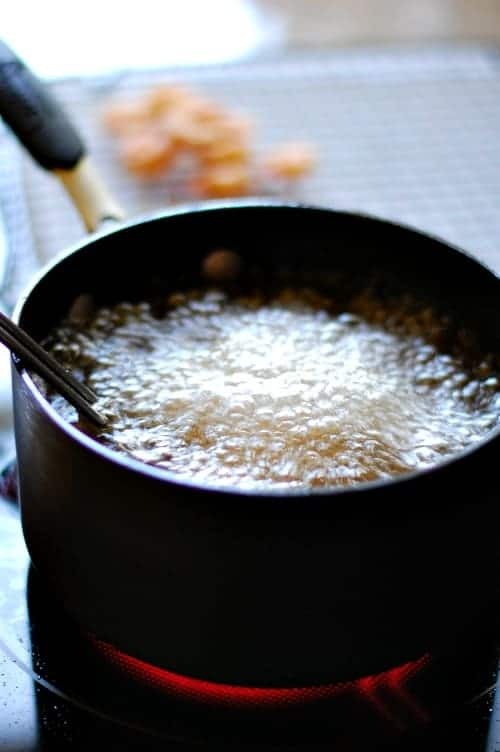 Remove 10 to 12 shrimp from the buttermilk, pat dry on paper towels, coat with cornstarch/panko mixture, place shrimp in a spider mesh basket and lower into hot oil. (You can also carefully lower the shrimp into the oil one at a time, fry and remove from the oil with a spider). Fry for 2 minutes, or until the shrimp is medium browned. Remove the shrimp and place on a cooling rack. Repeat for the remaining shrimp. Coat the shrimp with the sauce, serve on a bed of chopped lettuce, garnish with chopped green onion. We made this last night for appetizer as written and hubby went out of his mind 😄. He thought it was better than bonefish. Loved the sauce. Thank you for the tips and tricks. Thanks Johanna. I really appreciate your nice comment. So glad it was a hit with your husband. Absolutely perfect! I usually think “copycat” recipes are close but not quite….but this one is SPOT ON! Thank you for taking the time to decipher the perfect ingredients and directions! Love love love it! Thank you!! Thanks Mary. So glad you liked it. My husband doesn’t care for shrimp and LOVED this recipe! I used a deep fryer with basket and they came out perfect and not greasy! Thank you! Fantastic Andrea, glad you liked this. Hi! This looks sooo good! I’m making this tonight! Although I’d rather fry them, have you ever baked them? If so, how would you recommend doing it? Hi Jell. I have not tried baking them. If I were to try this, I’d put a cooling rack into a baking sheet and spray with some non-stick and bake them at a high temperature like 450°. Keep a close eye on them, it may take 10 to 15 minutes to brown. Also, if you are using larger shrimp, you could try to broil them. Put them 6 or 8 inches from the broiler for a couple minutes, then turn and brown the other side. This is really a trial and error situation. Good luck. Let me know how it works out if you try this. I ended up frying them. I had a problem problem with the breading falling off . I didn’t have a spider basket but next time I will try this method. Also, I couldn’t find sweet chili sauce , that was made in a peanut free facility, so I added plain sriracha chili sauce and added honey. This was very good! Looking forward to making it again and I’ll try baking them, also. Thank you for your recipe! Hi Jell. I’m glad you tried it. If the cornstarch gets too thick, it will have a tendency to fall off. Next time you will do it perfectly! I want to make this to take to a friend’s for an appetizer. How do I keep it hot for the 15 minute drive? And should I wait to put the sauce on the shrimp until I get there? Would it work to heat in the oven? Hi Marcy. I would wait to add the shrimp to the sauce, heat the fried shrimp and sauce as necessary. An oven would be best for the shrimp to make sure it stays a little crispy. Microwave would be fine for the sauce. Then combine the two. Have a fun party. Great recipe! Made this, based on reviews, and it didn’t disappoint! My kids (who are not picky eaters, but know when it’s a good recipe) LOVED it! The only thing I did differently was using a cast-iron pan and frying with small amounts of oil in small batches. Still turned out great! 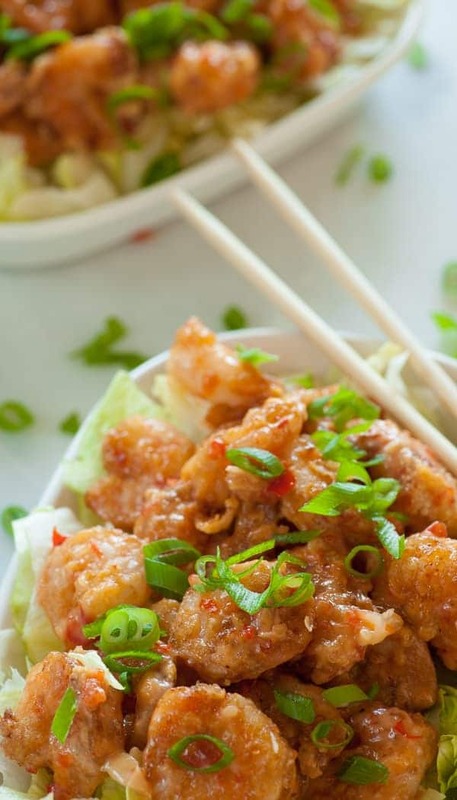 Making this tonight for my husbands 30th Birthday dinner 🙂 he requested bang bang shrimp from bonefish but didn’t want to go out so I found this recipe and we are so excited to try it! I made this tonight & it was amazing! I can’t imagine a better recipe for these shrimp. I read 3 or 4 copycat recipes before settiling on this one, and it is perfect! I followed your directions exactly, along with every tip you gave, and it was wonderful! I am a pretty good cook, & tweak a lot of recipes, but not this one-it is wonderful! Thank you, Joe! Hi Cynthia. Thank you for the nice review. Glad you liked it. I Love this recipe. One small change that I think makes it more bang bang like… PEANUT BUTTER. One tablespoon to the sauce gave it that Thai peanut flavor to mix with everything else. I never comment on recipes but the world needs to know about this. One of the best things to ever come out of my kitchen!! Hey Ryan thanks for the comment. I’ll have to try the peanut butter next time I make this. Interesting flavor profile I’m sure. I’ve never cooked shrimp at home before but this recipe inspires me to try! 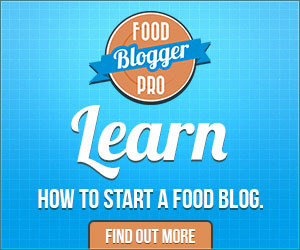 Can you clarify– is it supposed to be raw or pre-cooked frozen-shelled-de-veined shrimp? Hi Caleb, to make this dish, use raw shrimp. Thanks for your comment Anshu, glad you enjoyed it! This recipe is amazing! We use to live near a Bone Fish grille but since we moved further away we don’t go as often. 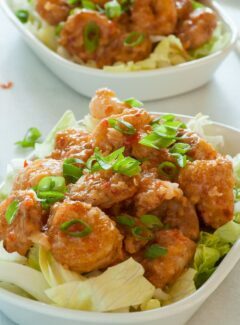 I found this recipe one day when I was craving some bang bang shrimp and it tastes EXACTLY like the real thing. This is hands down the most successful copy cat recipe I’ve ever tried. Thank you so much for sharing!!! Thanks Kelsey. What a nice comment! Oh my gosh! This looks SO good! I have to make this. Thanks so much for sharing! Now I’m hungry ha. Hi Ellie. Thanks for the comment…and it is really good! Ha Ha…Thanks Marie…Don’t want to come between you two, but try the Bonefish bang bang shrimp. I’ll think you’ll love it! Then try my recipe.! This looks so yummy I need to try! My boyfriend and I made bang bang shrimp tacos last night using this recipe and they were fantastic! Thank you so much for sharing! Thanks Laura…that sounds really tasty. I’ll have to try them as tacos. It looks simply scrumptious!! Can’t wait to try. Hi Allison, please let us know how it turns out for you. We love shrimp and this is one of our favorite meals with a salad and a glass of wine. If you like shrimp, it’s really worth your time to make this recipe. It’s really delicious!